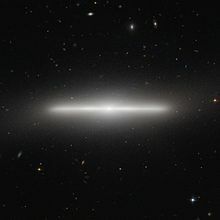 A lenticular galaxy is a type of irregular galaxy. These galaxies have an elliptical shape and ill-defined spiral arms. Basically, they are a combinations of spiral and elliptical galaxies. This page was last changed on 4 August 2015, at 07:35.